Please Note: Individual volunteers should obtain assurance in writing that their actions are indemnified by the appropriate government entity and their voluntary efforts are held harmless from personal liability. Beginning early this week, Western New York has experienced a significant snowfall event. 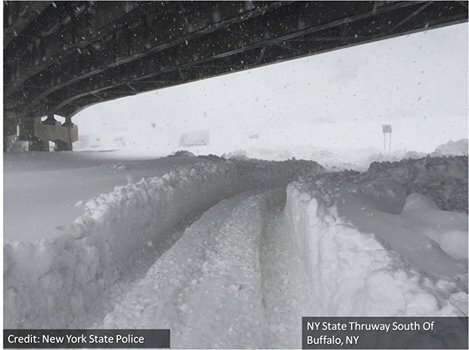 Over six feet of snow has accumulated in some areas. The weather service predicts temperatures will rise above freezing through early next week, resulting in a significant snowmelt and the potential for flooding in the region. There is also the risk of building collapse as a result of the weight of the snow. DBSC is assembling a list of individuals who would be available from Monday November 24 to Wednesday December 3. All Interested individuals (Code Enforcement Officials, Engineers and Architects) should send an email to CEDAR@dos.ny.gov, and indicate their name, contact information and available dates. Individuals will then be contacted with additional information. Dates available 11/23, 24, 25 and 12/1, 2.